(CNN) - A new poll shows razor-thin margins in potential matchups between President Barack Obama and former Massachusetts Gov. Mitt Romney in three critical battleground states. A Quinnipiac University survey released Thursday shows tight races between Obama and Romney, as well as former restaurant executive Herman Cain, in Florida, Ohio and Pennsylvania. Obama narrowly won all three of those states in 2008, and all carry large numbers of electoral votes. In Florida, Romney beats Obama 45%-42%. The poll's sampling error was 2.9% Obama eked out a narrow victory against Sen. John McCain in the Sunshine State in 2008 and will need to win the state again in 2012. Florida carries 29 electoral votes. 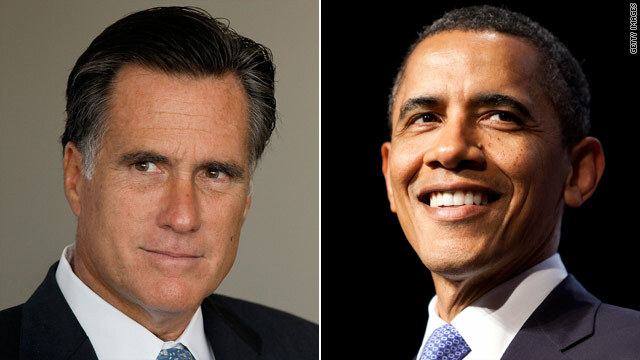 In a matchup with Cain, Obama edges the former Godfather's Pizza executive 45%-41%. The Quinnipiac poll was taken October 31-November 7 while Cain was battling accusations of sexual misconduct during his time as head of the National Restaurant Association in the 1990s. In Ohio, 45% of likely voters chose Obama while 42% picked Romney. That is outside the poll's sampling error of 2.7%. Obama also beats Cain, 48%-38%. Obama won Ohio by a narrow margin in 2008. The race in Pennsylvania between Obama and Romney is in a statistical dead heat with Obama at 44% and Romney 43%, within the poll's sampling error of 2.6%. Obama holds a more commanding lead over Cain, 48%-38%. Obama won Pennsylvania by nearly 10 points in 2008. The Quinnipiac poll also asked Republican voters their choice for the 2012 GOP presidential nomination. In Florida, which holds an early primary on January 31, Cain leads Romney 27%-21%. Former House Speaker Newt Gingrich came in third with 17%. The rest of the candidates registered in the single digits. Cain was also at the top of the poll in Ohio, beating Romney by five points. In Pennsylvania, Cain and Romney are tied at 17% each. A majority of voters in all three states say the economy is the most important issue going into the 2012 election, with health care and immigration issues coming in distant second and third places. The telephone poll of adult voters surveyed 1,185 voters in Florida, 1,312 in Ohio and 1,436 in Pennsylvania.